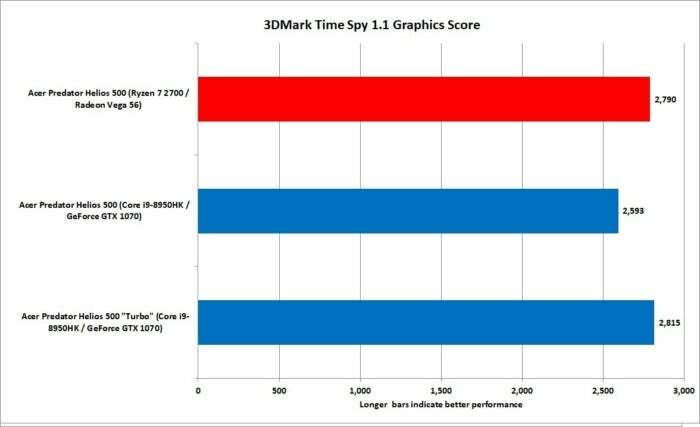 If you think this is all the fault of the Radeon RX Vega 56, we also ran the latest 3Dmark Time Spy 1.1 benchmark on both laptops. 3DMark Time Spy lets you dive down into just the graphics performance without considering CPU performance. While it’s synthetic, it can give you a relatively neutral test. The results we saw from the Radeon RX Vega 56 are a tick or two faster than the GeForce GTX 1070’s. That kinda matches desktop reality: The Radeon RX Vega 56 slightly outperformed the GeForce GTX 1070 enough that Nvidia went ahead and created the GeForce GTX 1070 Ti, just to put itself back on top. In this case, there is no GeForce GTX 1070 Ti riding to the rescue, but when overclocked in the Predator using the factory Turbo button, they were dead even. Using 3DMark’s TimeSpy graphics score, the Radeon RX Vega 56 is a step faster than the GeForce GTX 1070 which matches what we’ve seen on desktops. Moving on to more real-world games, we can see the situation improve for Team Red. In Tom Clancy’s Rainbow Six Siege, Team Red is just a tick slower than Team Blue and Green. While overclocking pushes Team Blue and Green ahead a little more, it’s clear there’s plenty of performance on both to play on the 144Hz 1080p screens. 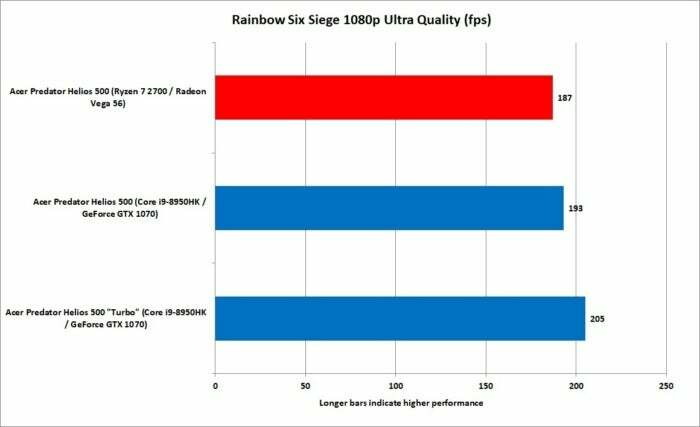 Ryzen and Radeon get within striking distance of Core i9 and GeForce in Rainbow Six Siege. Team Red also picks up a win in Deus Ex: Mankind Divided. This is a particular game that AMD has said doesn’t have the same issues as others have with Ryzen. The Radeon/Ryzen duo is basically on a par with the Core i9 / GeForce duo when overclocked. Deus Ex: Mankind Divided gives the edge to Radeon and Ryzen. We’ll finish off game testing with results from Shadows of the Tomb Raider. This is a fairly new game, and in DX12 mode it seems to prefer more CPU cores. The Radeon and Ryzen are good clip ahead of the GeForce/Core i9 combo. Radeon and Ryzen lead the way in Shadows of the Tomb Raider. 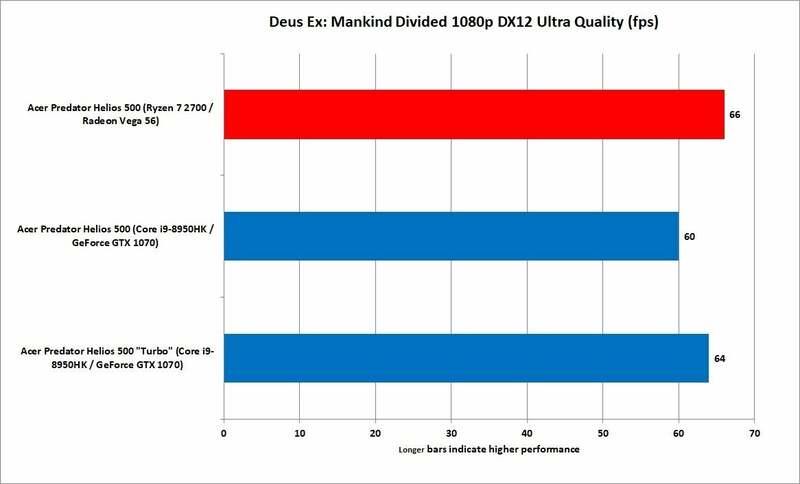 The chart above is simply average frame rate and, from what we can tell, more indicative of graphics performance. In other words: the Radeon RX Vega 56 is likely responsible for pushing it ahead. 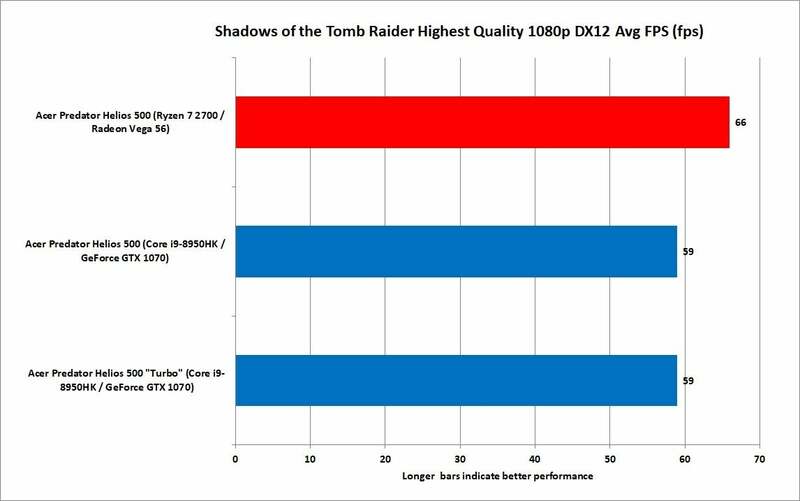 Shadows of the Tomb Raider also has a CPU frame rate reported, which seems to indicate what the performance would be if the GPU were taken out of the equation. 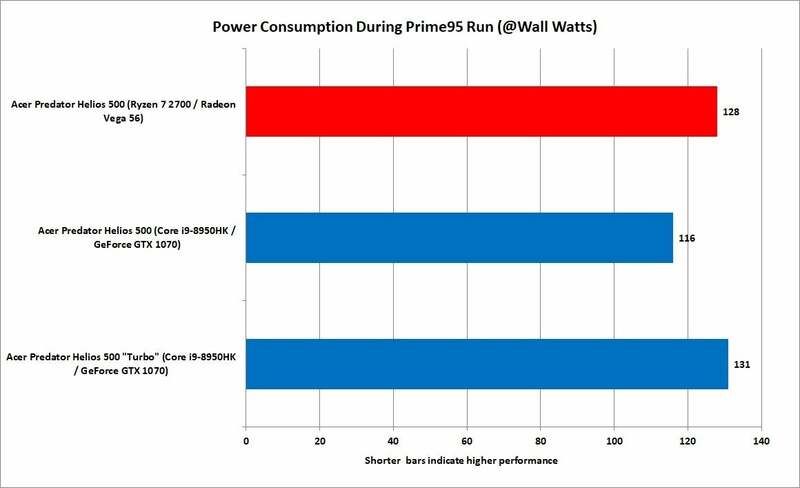 The result pretty much puts both on the same level, which makes us believe the high clock speeds of the Core i9 are enough to nullify most of Ryzen 7’s core advantage. Let’s call it mostly a tie in Shadows of the Tomb Raider for the CPU test. We wanted to see just how much each laptop consumed under a fixed power load. To try to separate CPU power consumption from GPU consumption, we used two different tests and measured at-the-wall power use using Watt meters. Screen brightness was set to the same 260 nits on both. Keep in mind that this is total system power, not just the CPU itself. First, we used the CPU Prime95 test to put a load on the laptops. For this test, we selected a version of Prime95 that does not use AVX. “Winning” would be using less power. The Core i9 laptop consumes a little less power, but when overclocked it gulps more—enough to make it a tie. We used Prime95 to put a load on the CPU at the wall. 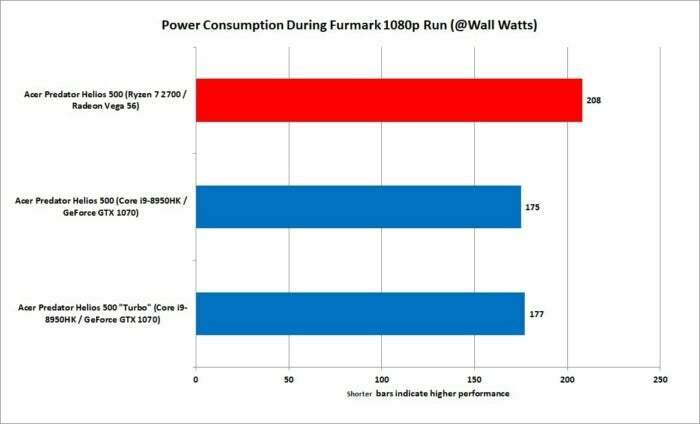 To gauge GPU power consumption, we used the stress test Furmark at 1080p and again monitored power consumption at the wall. The Radeon RX Vega 56 has a reputation for using more power than the equivalent GeForce. We see that reflected in the results, with the Radeon consuming 208 watts, vs. 175 watts for the GTX 1070. Even with the GeForce set to Turbo mode, the Radeon was still using considerably more power. It’s a fairly small difference, but those interested in ultra-efficiency may want to lean toward Team Green. The Radeon’s reputation for using more power is apparently well justified. Our last test is basic battery rundown performance. For the test, we use a 4K video file with the laptop set to 260 nits and airplane mode. We loop the video until it dies. Earbuds are used to reduce the power consumption of the laptop’s audio drivers. It’s clear that using desktop chips in a laptop hurts battery life. The 72 minutes it takes the Ryzen/Radeon combo to drain a 74-watt-hour battery is pretty atrocious. That said, we wouldn’t be bragging about the Intel/Nvidia’s 125 minutes either. To be fair, battery performance is not the highest priority for anyone buying a 17.3-inch, 8.5-pound laptop (12 pounds with brick). The vast majority of people who buy laptops this big and heavy care about only one thing: gaming performance. Gaming and battery life still don’t mix. If it took 125 minutes to drain the Intel/Nvidia box on video, you can expect gaming to cut it at least in half. 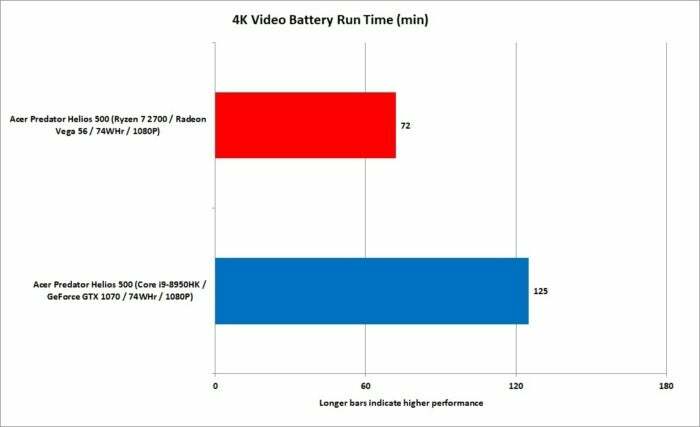 We’d say the battery life on the AMD-based Predator Helios 500 is atrocious with the battery life on the Intel and Nvidia-based Predator Helios 500 to be less atrocious. We have to say, we expected this to be basic repeat of the Ryzen 7 2700X vs. Core i7-8700K. It is, after all, an AMD 8-core against an Intel 6-core. The results were far more interesting than we expected. While we saw fairly huge differences in V-Ray and Corona, in a spate of other multi-threaded tests, the Core i9 came surprisingly close. The reason is most likely clock speed. The Ryzen 7 2700 in the Acer mostly tops out at 3.5GHz, with only occasional and very, very short bumps to 3.7GHz. The Core i9, even stock, was always well north of 4GHz. The Ryzen 7 2700 is also likely penalized by the fairly slow DDR4/2400 RAM. The CPU’s design almost mandates much higher-clocked DRAM, but on laptops that’s a lot more difficult to do. We do highly recommend the Ryzen 7 2700, but only if you are doing tasks (read: multithreaded) where you know it will offer the dividends. In reality, the Core i9 is going to give more people a lot more bang a lot more of the time. We thought that would translate into more solid wins for the Core i9/GeForce in gaming, but the Radeon Vega RX 56 saved the Ryzen’s day enough times that, well, you might actually want to buy it. Is there an actual winner? That depends. Buy the Ryzen 7/Radeon RX Vega 56 combo if you need the core count, and you’re OK giving up some gaming and single-threaded performance for it. If you’re mostly a gamer, the Core i9 / GeForce is the better choice for most titles, thanks to its higher clock speed.